Chop, slice, and mince fruits, vegetables, and meats with this Victorinox 47520 8" chef knife with Fibrox handle! While this knife's wide blade is perfect for lifting and moving chopped ingredients and foods, its 8" long size allows you to cut large amounts of product at a time as well. Plus, the handle's contours ensure that the knife will fit comfortably in your hand as you tackle food preparation tasks. This is the best knife, I use to use a wood handled knife and thought it was great but once you go Fibrox you never go back, I say that because you can easily chop wet things (potato,cabbage, lettuce,) without worrying about the knife slipping from your hand. This is an excellent knife, especially for the price. It feels good in my hand, being the perfect weight. The textured plastic grip makes it easy to hold even with wet hands. I would highly recommend it to anybody wanting a knife for home use or for kitchens where the cook won't be bringing their own knives. Hands down one of the best sized chef's knife for everyday use. The quality of the cutting given the lightweight design on first holding is completely dispelled and is a joy to handle and slice. The knife handles comfortably well when used with wet dripping hands as it does with dry hands. The clean up is a breeze and the handle does not soak up any water despite the given porous texture of the fibrox handle. Will definitely buy more of these. I work in a healthcare kitchen and needed a new chef's knife. Since I don't like to leave expensive knives laying around my kitchen and don't want the bother of carrying my knives back and forth, I was looking for a decent knife at a decent price. I own some incredibly expensive knives and take kitchen cutlery very seriously so I was surprised when this knife far exceeded my expectations and lived up to the hype surrounding it. I acclimated to it quickly and it performs beautifully with the basic everyday tasks I use it for. Slicing raw meat, even bacon, is effortless. Veggies don't stand a chance. It's definitely not the work of art that my Miyabi is, but it's a functional workhorse at a steal of a price. I'd buy it again and would be proud to give it as a gift. I'm in love with this chef's knife. The price point is considerably low considering the high quality. The knife rocks from the belly very well, has a good weight, is durable, and has a really great non-slip gripped handle that can get wet without becoming slippery. I would say that for the price, this is the best knife you're going to find. I love this knife I use it almost everyday for cutting up whole chickens I use it to cut up our chicken roll ups. Sometimes I use it to chop up veggies really fast. All in all it’s a great knife with a very sharp blade and many uses I would recomend this knife to anyone. I cook a fair amount. I am not a pro, but sometimes I pretend that I am. Best knife I have ever owned. I use this knife many times every day, rarely do I use another. It is very comfortable, well-balanced, versatile, and - paired with the Chef's Choice 4643 sharpener - unbelievable sharp. I am slicing meats and vegetables faster and thinner than I have ever before. I would recommend this knife to be used in every kitchen. By using it, it would cut your prep time down dramatically compared to other knives in the same price range. It is also very well made so don't be surprised if this lasts for many years to come. My go to knife for any young chef or folks still learning. Great balance, maintains edge decently well, and NSF. This is the knife I use at home as a general all purpose when I first started cooking. Affordable, well made, and is a great beginner knife. Excellent quality chef knife, with great edge retention. In my experience, best when sharpened to a 20 degree symmetric bevel on a fixed angle sharpener. At 15 degrees the edge doesn't hold long enough, and at 30 degrees, you lose a bit of sharpness. The knife heel is a bit taller than 2" and does not fit 2" blade guards. I didn't know what I was missing in the kitchen until I bought this knife. Very heavy duty and stays sharp. I use it for all kinds of prep on a daily basis and have never had an issue. I plan on buying many more!! This knife is a time saver! The blade is very sharp and it doesn't need to be sharpened for months at a time, even with a lot of use. It can also be placed in a dishwasher. Quality knives at an affordable price! Victorinox is one of the most recognized brands in the food prep industry! We just love the high quality and low price of these knives. You can't go wrong with this purchase! We highly recommend it. And Webstaurant store has the BEST prices! 5 stars! These Victorinox knives have been awesome for us. It was hard to find a decent knife that held up to the abuse of our kitchen staff. These have held up great so far. You really cant go wrong with this knife. It's our favorite. We found this one at 1/4 the cost of anything comparable. It sharpens easily and rarely needs it. We originally saw it one Americas Test Kitchen and will never go back to another. Thanks Victorinox! This is the best knife, I have not needed to sharpen it on the machine yet. Just using a steel. Recommended for everyday use and will stay sharp for a long time. I got my knife years ago as a gift. It holds an edge very well. (I learned after years of sharpening it to a European angle that it was originally ground to an Asian angle.) Since it's served me so well, is priced well, and will stand up to some abuse, it is my go-to graduation gift to get young adults started with their own solid knives. Great knife, exactly as described. Fits well in the hand and is used as any other chef knife would be used. Cleans easily and doesn't really have any places for food items to cake up inside. No knife in this price range can ever beat this model. It's so simple - no frills - but it responds so well every time. This knife, it's pairing knife counterpart, a bread knife, and a boning knife are all you really ever need. Excellent chef knife for the price. Dishwasher safe and clean hygienic handle. If you use a knife steel on it frequently you won't have to get it sharpened for a long time. I have had mine for over 3 years and still top condition and sharp. But of course its like habit to me to run it on the steel almost every time. This is my go-to knife. It is strong without being heavy. Stays sharp and is extremely comfortable in the hand. This was recommended by a magazine and it definitely does not disappoint. Best all-around chef's knife out there. It won't set you back much, but it cuts like it did just that. It has excellent steel, a nice sturdy no-slip handle, and it is well balanced. There are more aesthetically pleasing knives out there, but not more functional. This knife will surpass all expectations, in relation to function. I bought this knife after reading great review on it in a magazine. I really love this knife! It is razor sharp and has a fantastic feel to it. It makes chopping up veggies effortless. I own serveral Victorinox knifes and this one does not disappoint. Very high quality knife at a low price. This knife is unbeatable in price and performance. The knife holds a razor sharp edge, and if it loses the edge it is very easy to sharpen. Would repurchase. My wife also loves this knife. I have heard about this knife over the years, and I wish it didn't take me this long to finally purchase one. This knife is the best knife I have ever used. The size is perfect and the grip of the Fibrox handle keeps your hand from sliding when you cut things with lots of moisture or grease. It is sharp and cuts very easily. It is of a very good quality. The price is right, as well. A great buy!!! After reading magazines rave review of this knife, I bought one. I love everything about it...it's well constructed and holds an edge. HIghly recommended! Five Stars!!! If you need a pretty good knife that will face a lot of abuse, this is a great one. Compared to other knives in the price range, it's very good, but compared to a $100 knife, its flaws are quite apparent. I replaced this with a Wusthof Classic, and after using that, it became clear that the Victorniox doesn't hold a sharp edge nearly as well or for as long, and the handle is much more awkward and uncomfortable. In my experience, the handle, which claims to be slip resistant, is quite slippery if you're working with something fatty or greasy. All in all, it's a great knife for the price. I'd give it 5 stars if comparing it to similarly priced knives, but only 3 stars compared to a $100 knife...so I think a 4 star overall rating is appropriate. I use this knife but in a different color at work. These types of knives are really great. They are easy to use and comfortable. This specific knife is great to cut through vegetables, fruits or even meats. The quality of the knife does not deteriorate and the prices on this site are the best you will find anywhere. I have looked for victorinox knives on other sites and they are way more expensive. Great prices for great products! Excellent knife for kitchens and cooks. Keeps a decent edge with minimal upkeep, easy to hone on steel or stone. First knife out of my roll when I am on the line. Price is reasonable enough that i dont have to worry when another cook grabs my knife while beating out the dexters that most kitchens stock as they house knives. Overall I would recommend these knives to anyone starting out in the restaurant industry, at home cooks, or house knives for kitchens. Another excellent product from Victorinox. 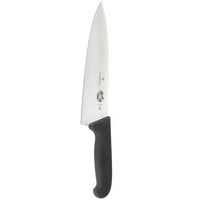 This knife is the perfect size to be an all around utility knife for any kitchen. As with all Victorinox Blades they are easy to sharpen and hold an edge for a long time. Excellent Chef's knife for general all purpose kitchen chores, does very well at chopping and dicing. Comfortable grip, maintains an edge very well, very easy to touch up with honing bar. Excellent product for the price. 8" Chef: 5 out of 5, The chef's knife is always the most important knife in the kitchen and Victorinox does not disappoint offering an extremely sharp edge that cuts through everything I have thrown at it with ease. 8" is a great size, and the grip is perfect allowing for several different grips perfectly. I actually like the fact that it is stamped and therefore a bit thinner than a forged knife, because it allows you to make more delicate cuts in task like mincing an onion. Probably like many others, I bought this because of its recommendation in Cooks Illustrated. As far as relatively inexpensive chef's knives go, this one is definitely superior to the cheap one I bought at a retail store as a stand-in until this one arrived. I decided to buy this knife after reading several articles in Cook's Illustrated. I am glad I did! The knife looks simple -- aside from somewhat unusual shape. But it is extremely comfortable to use -- it is "just right" for most of the tasks and feels better than any chef knife I tried before. very impress of this knife. We prep veges more than 10 full size bin in a day by knife. past 1 week still sharp, not too big, not too small size. very comfortable grip. this is a very nice knife. it cuts very easily. it stays sharp for a very long time it is easy to sharpen and easy to clean. This knife does not have the balance of a forged knife, but for our purposes (heavy use with lots of untrained students) it has worked very well. The blade has remained fairly sharp, and the handle is comfortable. For an inexpensive knife, I was very impressed. It sharpens easily, holds an edge, blade feels sturdy and is easy to handle. A perfect knife to take along on holidays or to the cabin when you don't want to take your expensive chef knives with you.